I understand the wisdom of not watching the clock but I can watch the dough all day and not know what I’m supposed to be looking for. This has doubled but not tripled. Does this look anything like it’s ready to shape? One of the reasons people don't usually have a simple answer prepared for this question (i.e. "Once and for all, how do I know when it's ready?") is that what you really need to know is the condition of the dough, not its position. How it has been "acting" is more important than how it looks. The guides such as "double in size but not triple" are useful only because they usually more-or-less correlate with what you really want to know, not because they mean anything in themselves. However, with the very clear picture you've added (rather than just a general question), I'm sure you'll get some really good responses. but it is hard if I can’t tell by looking or timing. Sounds like that is the reality though. In a small town there just aren’t any bread baking classes so I’m not sure how to improve. It looked so active and nuts I didn’t want to wait until it tripled. I’m thinking over since it’s not springing back much half an hour into the proof waiting for the oven to preheat. I agree with David. If you carry on at this stage im sure you'll get a lovely loaf. Definitely full of bubbles and passing the window pane test. But then again judging if it's under or over can only really be done by practice, seeing how it responds and feels. Is there strength left in the dough? 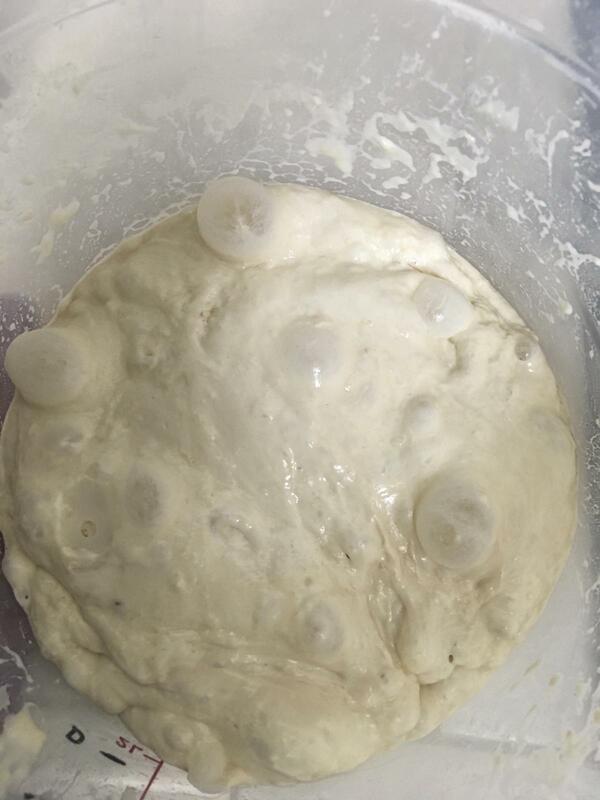 Has the dough degraded at all? How did the dough behave at different stages (to know if it's under or over) etc. Certainly looks good but if it has gone over then this will be a notch on your learning curve. One can only explain so much the rest is practice. I've never made a loaf this bad. I like holes but wow. I’m guessing over although it had just doubled. Last time it close to tripled and looked more normal than this. The indent stayed with the finger dent test. I think that huge gaping hole is more down to shaping. Keep the smaller bubbles, don't deflate the dough but knock out the larger bubbles. I suspect this is one bubble from the original photo. I did have some difficulty due to a bandaged finger and I was also trying hard to be gentle. Maybe too much. I’ll take good notes on the next bake. Different types of dough need different levels of gentleness too. Getting used to how this type of dough reacts to how you treat it, will give you better and better success with this kind of bread - but you'll have to adjust your tactics when you try a completely different recipe. So it might be smart to stick with this recipe only, until you're reasonably satisfied that you can get a good result out of it whenever you want to. I had a plan to cook the Forkish book. Guess that will be a slow process. I seem to be going backward in my skills. I like the suggestion of doing one recipe over and over. I do have a totally successful starter and a beginner sourdough recipe that is semi successful. I’ll take notes and alternate these two until the lightbulb goes on. Thanks so much for the your suggestions. I appreciate your frustration. FWSY is a great book. But it's challenging for home baker on many fronts. - when the dough rises to a double (not beyond), then shape, place in basket and retard in the fridge to bake the next morning straight out of the fridge into the warmed oven; keep the fridge time to less than 12 hours max, ideally 10.. Sounds stupid I know.. but this will do two things. #1 less starter means a slower dough development/fermentation process and #2 by shaping when doubled (and not more) you'll be making sure the room temp (if too warm) won't be pushing your dough too far in terms of fermentation and yeast development. Try it and compare it to whtat you just did and see the difference.. Remember what you can control is ingredients, folding/shaping technique, strength of starter, ambient temperature and time.. those are the variables you get to play with. Stretch and folds are good, but I've come to like coil/letter folds more to develop dough structure. Lastly, find someone in your city and have them over to walk you through a bake.. a good cup of coffee goes a long way! Good luck!! Thanks Bread19 for the good words. I’ll try those suggestions. I bought the Crumb Mastery e-book last week and have just begun watching Trevor videos. It is discouraging to end the day pulling a frisbee out of the oven but they taste pretty good. What happens when people leave?